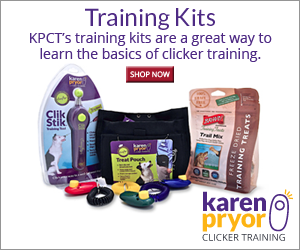 By becoming an official Karen Pryor Clicker Training Affiliate, you'll earn a sales commission on the purchases of every customer you refer to us. The program is powered by shareasale.com an affiliate technology provider. All you need is a website that appeals to pet owners! We do the rest. It's fast and easy. Sign up now! Most people think of a website as a necessary marketing expense. What if there was a simple way to generate revenue from your website without the hassle of opening and maintaining a store? There is. By joining our affiliate program, you link your organization to www.clickertraining.com and earn a sales commission (a percent of the total sale price) on clicker training products including clickers, books, videos, etc. Several hundred businesses are already our affiliates, earning income with the products they support. Won't you join them? It's free, and a way to do well as you do good. Already an affiliate? See below for how to add ClickerExpo to your affiliate program! Become an Affiliate. NEW! ClickerExpo: Now Part of the Affiliate Program! If you are already a KPCT affiliate, log in and add the ClickerExpo affiliate banners to your website. If you aren't an affiliate yet, join now, and don't forget to download the banners! Do dog trainers need websites? What makes an affiliate really successful? If I join the KPCT affiliate program, how do I know I'll get paid? If I join your affiliate program, what is my commission on sales? Are the ClickerExpo program and the Clickertraining.com affiliate program different? Should I join both? What happens if someone clicks through to your site and comes back later to buy or register? Do I still get credit? Can you take me to the website of one of your affiliates so I can see this? Can I join more than one affiliate program? What do the banners and links look like? Do I need a website to participate in the affiliate program? Explain this to me one more time, how does this work? Like it or not, having a website is simply expected these days. More often than not, it's the first place people go to get information about you and your services. The problem is, once you've built your website, how do you keep customers coming back? How do you lure new customers? The answer is to keep your content fresh and interesting. Get great training content for your website, free. Affiliates generating above average revenue make use of their web page real estate and the available links and banners. They place links where they'll be seen and be easily understood. For example, if your site includes a list of recommended books, you may want to load the Click to Calm link into that section! If you have a section on canine aggression, you'll want to place it there too. Our affiliate program is managed by a company that installs and manages affiliate programs for thousands of companies. We pay them to manage it and to do it right, and they do an excellent job. Payments are made automatically every month and sent to you electronically or via check. It's proven to be a very reliable system. Join now. Read our ShareASale program page for details on commissions. The programs are different only in that the Clickertraining.com affiliate program pays a commission calculated as a percentage of the completed sale and the ClickerExpo program pays a flat rate per successful registration. Joining one will give you access to the other; it makes sense to join both. that you would place on your website. Yes. Visits are tracked for 30 days so if they purchase or register within 30 days of their visit you'll earn a commission. Absolutely. We have an affiliate program and so do others. Affiliating yourself with other trusted companies is a smart policy. Clickerlessons.com, for example, has several affiliate programs on their website including those for Amazon, jbpets, and clickertraining.com. Suppose you love Emma Parsons 's new book Click to Calm and you recommend it frequently to others. With an affiliate program, you can earn something for that recommendation. Affiliate programs provide an infrastructure—a complete software system—to make that possible.